1. In a large skillet, heat the oil over medium health. Add the garlic and crushed red pepper and sauté for 30 seconds. Add the shrimp and sauté for 3-4 minutes, until shrimp is cooked through and turns pink. Remove the shrimp from the skillet. 2. Add the wine and lemon juice and bring to a boil. Add the broth and bring back to a boil. Season with lemon zest, salt and pepper. Pour over the shrimp and serve. I like keeping a bag of the frozen cooked shrimp on hand, especially when I can buy a bag for under $8-9.00. 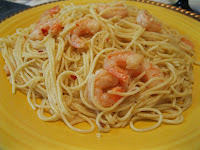 After cooking the pasta [Dreamfields angel hair pasta], I like to put it in the skillet with the shrimp to absorb the flavors.